While skydiving is an extreme sport – and as such, poses some inherent risks – there are many skydiving safety precautions taken on each and every jump that mitigate those risks greatly. 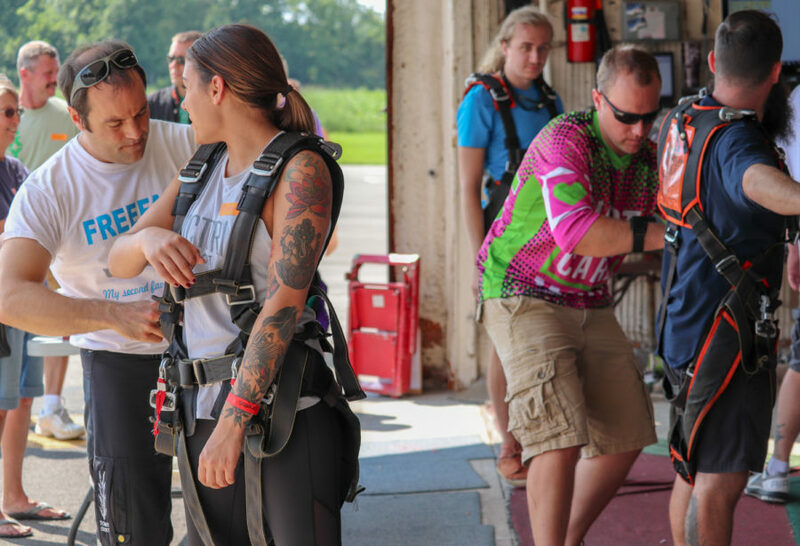 At WNY Skydiving, we are committed to not only practicing stringent safety. We also make efforts to share information and skydiving safety facts to keep our community and clients informed and prepared. One of the ways we encourage everyone to actively participate in learning about skydiving safety is with our annual Safety Day at the beginning of the season. Safety Day was established by the United States Parachute Association in 1997, using an idea presented by Patti Chernis. At its core, Safety Day is there to open up a forum at local drop zones. It informs skydivers of new developments in the industry, helps them brush up on important safety info, and familiarizes them with aircraft and safety procedures. Often, participants can expect to have hands-on practices of safety procedures, attend seminars from skydiving operation professionals, and experience gear familiarity training and evaluations. We just had WNY Skydiving’s own Safety Day on March 9th, 2019! 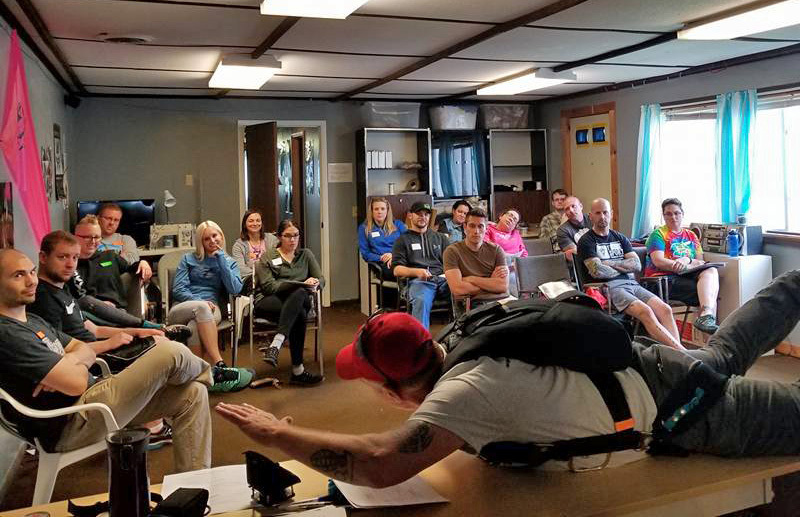 Our dropzone operator Tim Allen, as well as several instructors and coaches, covered a heap of different skydiving-related safety topics and tips. Licensed skydivers and AFF/Coach students were able to participate in a day chock-full of pertinent information – and a pizza/potluck lunch. Join us for Skydiving Safety Day 2019! Rigger and instructor Brian Piper presented a seminar on equipment. He covered pre-jump gear inspections, gear checks, general gear maintenance, service bulletins, and gear compatibility. Bob McEvoy, our Safety & Training Advisor (S&TA), tandem/AFF instructor and rigger talked about freefall safety. He covered exit order, awareness of others in group skydiving and breaking off and tracking procedures. In addition, the tackled opening procedures, flying in orientations other than belly to earth (such as head down skydiving), and jumping with objects such as inflatables/tubes/flags/etc. Our dropzone operator, Tim Allen, discussed parachute malfunctions and emergency procedures, aircraft procedures, and flying with cameras. Andrew Laurienzo, a pilot and coach, taught the audience about canopy control and landing patterns, collision avoidance, and dropzone rules regarding canopy flight. Josh Preston, tandem instructor and coach at our Wingsuit School, explained wingsuit flying procedures, proper training needed prior to a first wingsuit jump, and wingsuit-specific emergency procedures. So you see: we’re working diligently to make this sport – and your jump – as safe as it can be by using thorough training, education, and state-of-the-art equipment. Did you know a person is more likely to be killed by a bee sting or lightning than on a skydive? The USPA stats confirm it! What about driving a car vs jumping out of a plane? Yupp – you guessed it. Ready to book your tandem skydive then? You can do so with the knowledge that WNY Skydiving is 100% looking out for your safety first. Call us if you have any questions though and we’re happy to talk to you in-depth about our skydiving safety precautions.